Happy Labor Day! Hope you are enjoying your weekend........though it is the last official "summer" weekend. 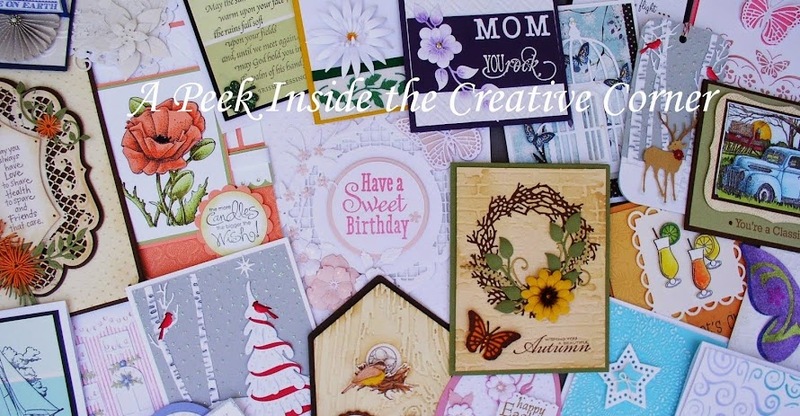 But, hey, now you can really start thinking about your fall and Christmas projects! 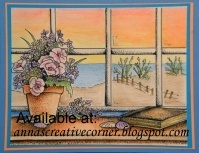 Stacy has released her new stamps, "By my Window" series and here is a look at them! And for those of you who love to color, these stamps were made for YOU! These stamps are quite large, so they pretty much cover an A2 size card. You just sit back and color the images (you know, when you are watching TV you can relax and NOT fall asleep because you are coloring!) If you were here when Stacy visited, you were lucky to see these up close and personal. Stacy had them colored and gave us lots of ideas on how to make them pop...........add crystal effects to the pumpkin to make it look glossy like a ceramic vase. 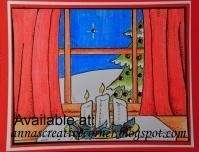 Add Swarovski crystals to the Christmas scene to make it sparkle.....and don't forget about the star outside! Stamp extra images and only color some parts so that you can cut those out and pop them on the fully colored scene. The possibilities are endless!!! I know many of you were intrigued by these new stamps.........please let me know if you would like me to get them for you! 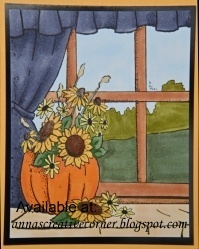 You can start with the fall scene now! (they come individually, you do not need to buy the whole series). So, try one out and see if you like it! 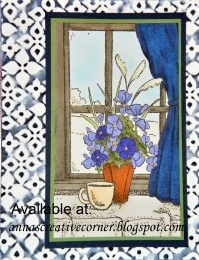 Oh Anna how sweet of you to feature the By My Window series...but wait we have done so much more with ...we have done spot light coloring and even so monochromatic color I will send you some pictures they are fabulous! I have them in stock too! Oh ...can't wait to see the new samples!